This is an important mosque in Ankara which can hold 24,000 worshippers at one time. 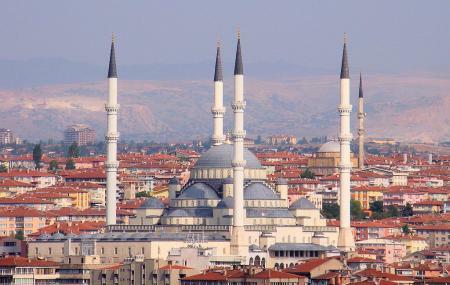 It has magnificent minarets standing 88 metres high and is constructed in neo-classical ottoman style of architecture. It has stunning marble interiors, tinted windows and resplendent artwork of its central dome enchants the visitors. It is visible from the entire city and is one of the largest Islamic religious buildings in the world. How popular is Kocatepe Mosque? People normally club together Ataturk Mausoleum Or AnitKabir and Cengelhan Rahmi M Koc Museum while planning their visit to Kocatepe Mosque. This mosque is one of Ankara’s biggest mosques. Also one of the most beautiful mosques that is made during Turkish Republic (not comparing to the mosques that was made in Ottoman time) The atmosphere inside is very beautiful and relaxing. Balconies inside are for women. On Friday afternoons the mosque is totally full. Huge, grand Mosque. Internal lights is splendid. Look better with lighting at night. Holy place. The mosque is huge and it really gives you a peace of mind. Well-buily and it was worth coming here. The Kocatepe Camii Mosque is so elegant and strong spirituality. This is a great place you don’t miss to visit. Magnificent great and huge praying place. Clean and calm best place to spiritual entertainment in the neighborhood.